A CNC router or mill which uses a high-speed spinning cutting tool creates parts through a subtractive process, whereas a 3D printer uses an additive process. The advantage of a 3D printer is that it can create parts with internal voids and spaces, whereas the CNC router cannot. 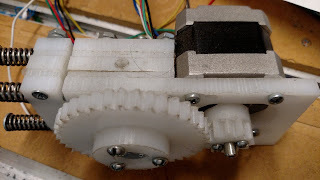 I needed to create a 3D part that contained places for some bearings, a shaft with a hobbed section, a NEMA-17 motor mount, a set of reduction gears and an idler bearing assembly which presses the filament into the hobbed shaft. I had some sheets of HDPE (High Density Polyethylene) which I intended to use for various projects on the CNC router. Some were .25" (~8mm) think and some where .125" (~4mm) thick. I figured I could stack several layers of these sheets, each of which are cut to a specific shape, to create a sturdy and strong mechanism. So, I broke out the 3D CAD software and created each layer as a separate part that I could run through the CAM program to create the G-Code program to cut out each individual layer. I could also take each part and "assemble" them in the CAD software to see how the completed part would look and how each part lines up. These are the main layers. There is the one end that holds the motor, the center portion where the idler bearing presses the filament against the hobbed shaft, and other end. There are also thinner layers (the .125" thick HDPE) between these to provide enough room for the idler bearing to move freely and the main shaft bearings to rest against. The extra part at the left end is the idler pressure assembly. There are long machine screws with strong springs around them which press that assembly against the shaft hold the idler bearing. That, in turn, presses the idler against the filament and into the hobbed shaft. The hexagonal center is where the hex-head of the shaft bolt sits. This part was processed with the CAM software such that the main gear was one part and the center hub assembly was another. The parts were then screwed together to form a single unit. 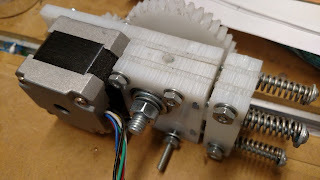 Here are several views of the completed extruder assembly. There were several of the holes that I had to manually drill out on the drill-press. 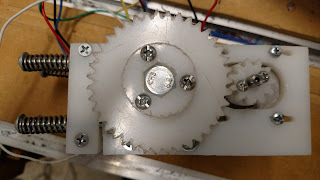 Namely, the ones that into which the idler assembly screws went into and the hole through which the filament is passed. This whole assembly then sat atop the actual extruder nozzle assembly. The nozzle assembly consists of a cold end which is thermally isolated and cooled from the hot-end. I did purchase off-the-shelf brass nozzles, heater block and 12V heater. I made the rest of the nozzle, including the threaded and drilled center brass tube. I used a .5" diameter PTFE (aka. Teflon(r)) rod drilled and threaded to help isolate the hot end from the filament driver assembly. I installed this whole assembly onto the CNC machine in place of the router/spindle. After a lot of fiddling and tuning, I finally got it to print reliably. Once it was printing reliably, one of the first tasks was to print its replacement. The replacement extruder filament driver assembly is smaller, has only two parts (the main body and the hinged idler block), and has been much more reliable since the idler has better contact and pressure against the filament. Once I had the new, 3D printed extruder filament driver working, I started printing parts for a dedicated stand-alone 3D printer. Rather than go with a normal X-Y-Z printer, I've opted for a slightly scaled up version of the Rostock, delta printer. These printers can print in the horizontal plane about as much as most other 3D printer designes, but the Z axis is many times more because of how the whole mechanism operates with the 3 vertical carriages. They can also move very quickly in 3D space. This new printer is still a work-in-progress. Most of the mechanical portions, except the extruder and filament drive mechanism, are constructed and in place. I'm sure I'll cover some of its construction at some point. Once it's complete and running, I'll convert this 3D printer back to a CNC router.